Traditional Mexican clothing its unique and that makes it really fascinating. 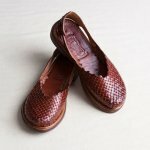 It can be due to the woven process, materials, texture, color, balanced designs or simply the hands that made it. Authentic Mexican clothing has a long tradition in the indigenous cultures of Mexico, but it has also adapted through time. Women clothing has changed less than clothing for men, and many more indigenous women in Mexico today still use traditional clothing. In pre-Hispanic times, women wore items such as enredo, quechquémitl and huipil. Later when the Spaniards arrived, women started to use European style blouses with some of the same embroidery. Traditional Mexican clothing for men were called tilma and maxtlatl, which were replaced by European style shirts and pants. We are please to offer you a gallery of traditional items we have found wondering around Mexico. These are some of the most popular and best representations of Mexican women wearing their traditional clothing. Please keep in mind that we made a distinction between traditional items and regional items. For more info please look at our Mexican clothing guide. The Puebla traditional dress is used by a very small community near Tehuacan in the center of the state of Puebla. We believe they were originally made by an Aztec community called Achimalacatla. However, the tunic dress and blouses are world famous thanks to their unique designs and color. Today this dress is made by women in the area surrounding Tehuacan for sale to the world. We are happy to offer this traditional Mexican dress for sale in our Mexican clothing store. The San Antonino dress is one of the most beautiful garments that is famous around the world. The design is derived from the traditional dress in the Central Valley in Ocotlan Oaxaca. The small and full embroidery with satin thread mimics silk and looks amazing. 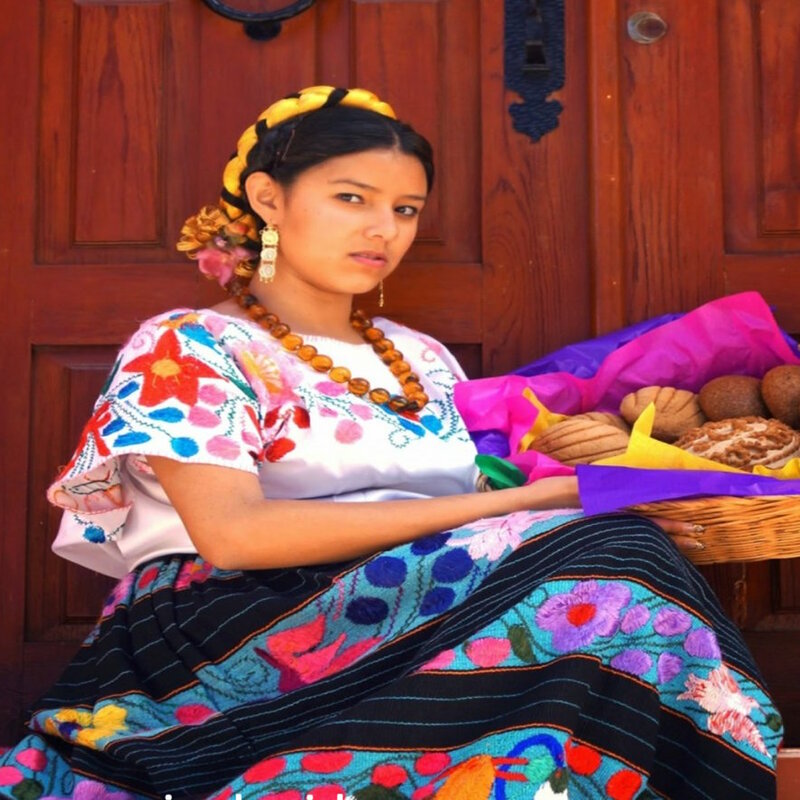 The typical dress of the Purepecha woman from the state of Michoacan in the middle of Mexico consists of a large skirt called sabalina with beautiful embroidered large flowers and stripes of black. The skirt is attached with cords to the waist. The blouse is typically white with colorful flowers embroidered in the sleeves and chest. It also has a traditional apron. Today, traditional Mexican clothing is gaining popularity around the world, promoting Mexican culture, and art. The symbols made by knitting and embroidery are fundamentally simple: triangles, rectangles, rhombuses, zigzag lines, stepped borders, helical patterns, crosses, etc. For example, the triangle is widely used forming rhombuses in Huichol art. Also, flowers and stars with eight tips are applied in embroideries from the Otomís, Nahuas, Huastecos and Huichols. The stepped borders design has a distinguishable pre-Hispanic origin. Nature and the human figure are the main inspiration emblems in most of the Mexican embroidery and knits. 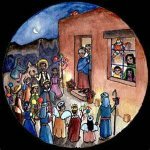 The arrival of the Spanish conquistador brought Christian symbols such as the cross, the Virgin Mary, saints, angels and others. The Mexican national symbol with an eagle on a prickly pear cactus is now famous too. In the Purepecha region in near the city of Morelia, textiles are embroidered with popular phrases or significant dates. 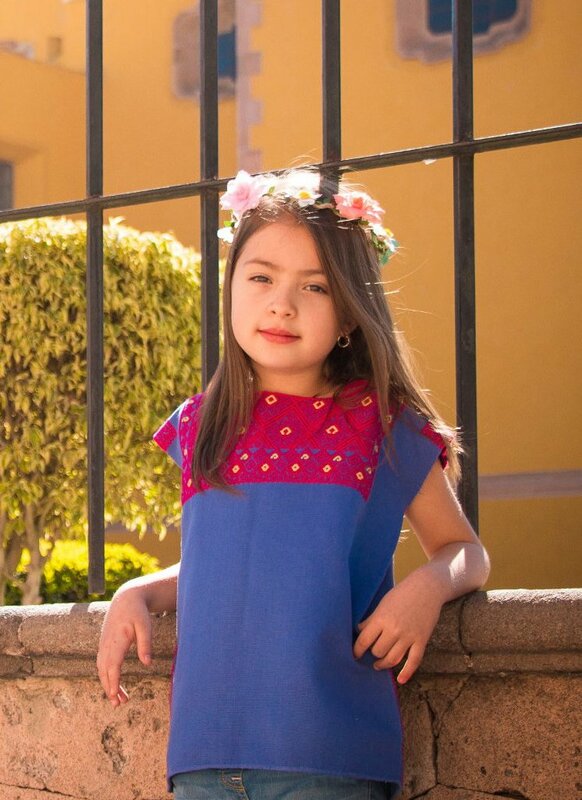 Mexican traditional clothing is getting popularity due to its simplistic beauty. Its symbols, art and history enrich it and make it even more interesting. There are hundreds of different traditional garments worn by indigenous women, but we have only focused on the ones that are most searched by people around the world. We will be adding more items so please send us your suggestions.